The Spectrum of Risk Lesions in Breast Pathology: Risk Factors or Cancer Precursors? Risk lesions of the breast are histologically, biologically, and clinically diverse, with varying associated risks of cancer development. In this chapter, the definitions of risk markers and precursor lesions are defined and explored. We summarize the contemporary paradigm of breast carcinogenesis and how atypical lesions of the breast may fit into the estrogen receptor-positive cancer development pathways. 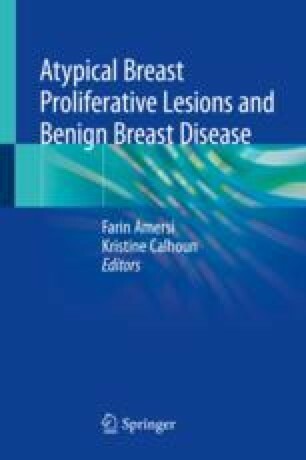 For atypical ductal hyperplasia, atypical lobular hyperplasia, flat epithelial atypia, radial scar, papilloma, and fibroepithelial lesions, evidence is summarized regarding each lesion’s (1) association with long-term overall risk of developing breast cancer and (2) possible precursor role in cancer development.